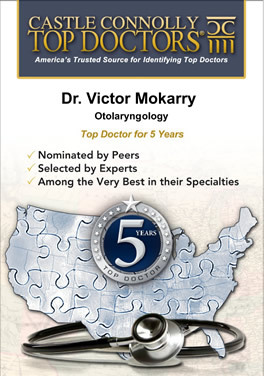 Dr. Victor Mokarry for making the TOP Doctors for 5 years! Dr. Victor Mokarry received his undergraduate education at Boston College. After graduating with honors, he attented Loyola Stritch School of Medicine in Illinois. 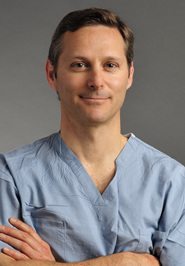 He then completed his Otolaryngology - Head and Neck Surgery residency at the Loyola University Otolaryngology program, while training at Children's Memorial Hospital, Hines VA Hospital, St. Francis Hospital in Evanston, and the Alaska Native Medical Center in Anchorage. After residency, he completed his board certification and joined Drs. Buckingham and Ferrer. The practice later became Northwest ENT Associates, SC. The practice currently serves Presence Resurrection Medical Center in Chicago and Alexian Brother Medical Center in Elk Grove Village. Dr. Mokarry has been an active member of hospital leadership, being former Medical Staff President and Chairman of the Section of Otolaryngology. He has held various other positions of hospital leadership. Dr. Mokarry has been selected to the Chicago area's "Top Doctors" by the Castle Connolly Medical Guide for over ten years and is listed as a Top Doctor by Western Suburban Living. He sees patients of all ages, treating pediatric disorders, head and neck cancer, hearing problems and ear diseases, nasal and sinus problems, voice and thyroid surgery.